Presented by Sponsor: Graco Inc.
Takeaway: Wet and vapor abrasive blasting offers significant advantages over dry abrasive blasting, but selecting the best equipment for your needs requires an understanding of five important factors. Wade Hannon is affiliated with Graco Inc. and can be contacted using the options on the right. For info on how we work with industry partners click here. Wet and vapor abrasive blasting offers significant advantages over dry abrasive blasting, but selecting the best equipment for your needs requires an understanding of five important factors: ease of use and long-term maintenance, water usage, media usage, blast performance and dust suppression. 1. 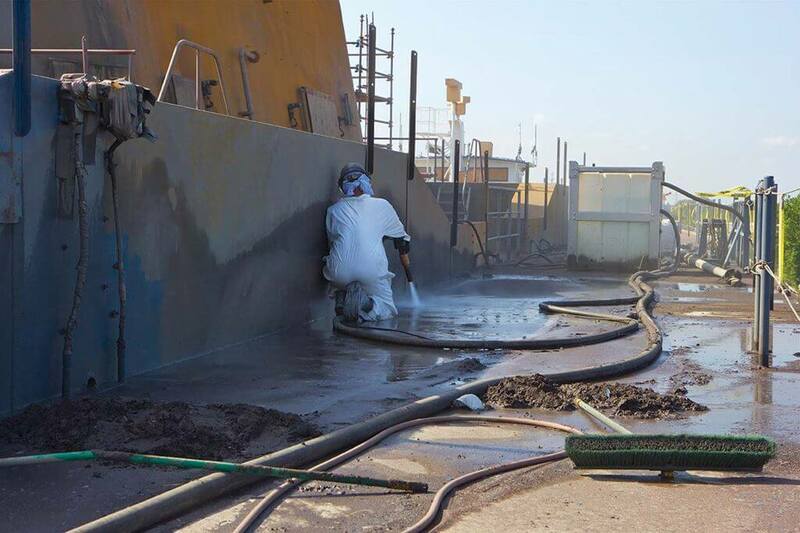 Dry (air) abrasive blasting, which is popular but in recent years has lost favor due to the large quantities of dust that is generated when the abrasive media strikes the substrate and flies around the work area. 2. Wet or vapor abrasive blasting is designed to suppress the abrasive media using water to make cleanup easier and the environment easier to work in. While wet abrasive blasting is an improvement over dry abrasive blasting, some designs have drawbacks or potential problems. In vapor abrasive blasting, only water and abrasive media are combined in a pot under water pressure and then injected into the airflow. Figure 1. Diagram of vapor abrasive blasting machine. With many designs on the market it’s hard to know what to look for. Here we examine five things to consider when selecting wet or vapor abrasive blasting equipment for your next project. Abrasive blasting is often performed outside in challenging environmental conditions, tight spaces or areas that are difficult to reach. (For an example, see Marine Structures Create Unique Challenges for Third-Party Inspectors.) Therefore, it is important that the equipment be easy to use and maintain through its lifespan. Ideally, the controls and settings are easy like dry blasting where the operator only has to adjust an abrasive meter and the blast pressure to get the desired outcome. Look for a machine that has the pot pressure is set and calibrated at the factory so the operator doesn’t have to experiment with the controls on every job trying to find the correct setting to maintain blast consistency. 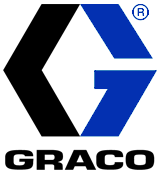 Systems that incorporate gauges to provide feedback on media usage rates help the operator track their progress and manage costs. Finally, consider what level of support you can expect from the manufacturer and distributors when the machine requires spare parts or repairs. Manufacturers that stand behind their products should offer suitable warranty terms. Equipment that has a wide base of support allows you to choose from multiple distributors and repair facilities. Consider where the equipment and spare parts are manufactured, and whether they will be readily available in your area over the long term. When making a purchase decision look at the equipment’s specs to determine how much water is used, and ask to see a demonstration so you can gauge the water usage for yourself. Confirm that the manufacturer’s data is correct and substantiated by an independent and reliable third-party testing service. Modern designs can operate effectively using 0.5 to 1.0 quart/min (0.47 to 1.06 liters/min). Other systems using water injection or halo nozzles may use much more water to control the dust. Because each media type has different characteristics, ensure the wet or vapor abrasive machine handles a range of media sizes from course (12 grit) to fine (150 grit) so the machine can be used for a variety of projects. A good wet/vapor abrasive blast system should be able to handle the same types and sizes of media as a dry blaster, with the exception of medias that will corrode if a rust inhibitor is not present. Ideally, you’ll be able to easily set and monitor the abrasive consumption rate, and the pot should have sufficient capacity to allow the operator to blast continuously for over an hour. Remember, less media consumed translates to lower operational costs. Minimizing water and abrasive usage needn’t compromise overall blast performance. One way to measure performance is the removal rate, typically measured in feet2/min or meter2/min. Wet/vapor abrasive blasters compare favorably to dry abrasive blasters, offering equal or faster removal rates. Once again, a demonstration or published third-party test results are desirable to confirm the manufacturer’s claims. Another way to measure performance is the machine's maximum blast pressure rating, i.e., blasting pressure that is exerted on the surface being cleaned or prepared. Make sure the machine has a pressure rating to handle the highest blast pressure that compressors can produce at a given flow rate. It is desirable if the blasting equipment can handle both low and high airflow/pressure applications. The ability to develop a maximum blast pressure up to 175 psi (10.3 bar) allows the operator to rapidly blast stubborn areas of corrosion stains or old coatings. 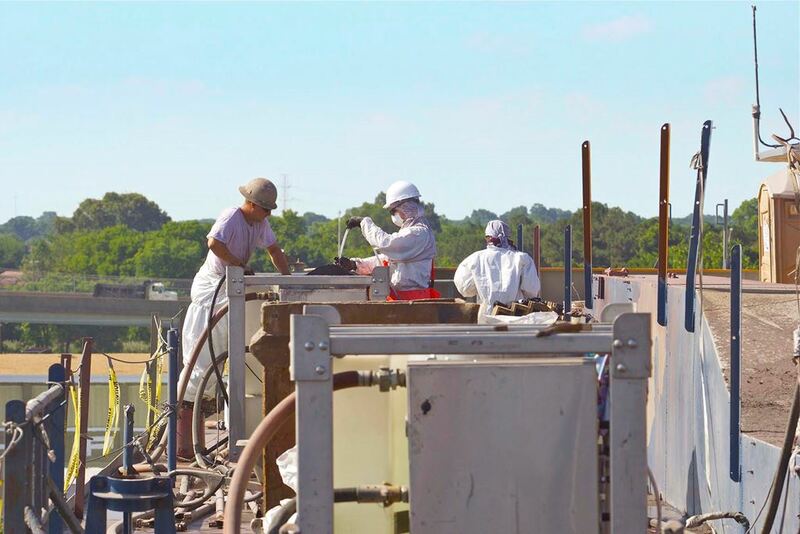 Conversely, the ability to finely adjust the air pressure and the water/abrasive media mixture to a low level means the same equipment can be used for blasting a wider range of surfaces, such as wood decks, soft materials or fragile items. Dust is created when the abrasive strikes a surface and breaks into fine particles. Wet blasting technologies reduce the amount of dust floating in the air by encapsulating the dust particles in water droplets and increasing their weight so they quickly fall to the ground. Figure 2. 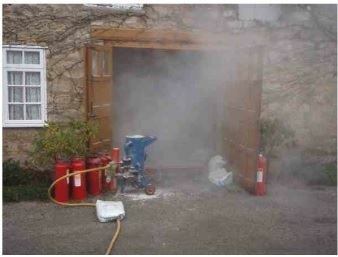 Dust plume created by air abrasive blasting. Unfortunately, the topic of dust suppression is one that lends itself to a manufacturer’s embellishment. Remember, although vapor and wet abrasive blasting is a huge improvement over dry blasting, truly dustless blasting doesn’t exist, so don’t take a claim at face value. The manufacturer should be able to provide reputable third-party test lab reports that validate their claims with specific measurements of airborne particulate concentrations using a variety of media.